It seems like every other day, some quaint and cuddly, blasphemy-themed chain restaurant from New Zealand is messing with Texas. And by Texas, I mean Jesus. This time it's Hell Pizza, which is running a billboard campaign that, at first glance, only appears mouth-watering. It's only when you look a little closer that you start to see all the offensive, Jesus-related things going on here. Keep looking if it doesn't jump out at you right away, everybuzzy. It took me a few hours to figure it out, too. Limited time??!?! Earth to Hell Pizza: Jesus is with us always and everywhere. And his buns, unlike yours, totally rule. Honestly, I think I'm getting quaint-and-cuddly,-blasphemy-themed-chain-restaurant-from-New-Zealand-messing-with-Texas-and-by-Texas-I-mean-Jesus fatigue. And apparently, I'm not the only one. Church peeple are getting seriously peeved about all this meanness directed at Our Lord and Savior. For realsies! Anglican Church media officer Lloyd Ashton said the campaign was disrespectful to many religions and the people who followed them. "They [the billboards] join a long line of advertising that's in questionable taste that slings off [at] things that lots of people hold precious. "It's disrespectful to what a lot of people hold very dear." I've always been an admirer of Anglican Church media officer Lloyd Ashton's work, but I have to say, I really don't get how this campaign would be disrespectful to many religions. Since when is there more than one religion? I thought there was just Christianity and then 6.4 billion people who are totally wrong about everything. Whatever the case may be, though, it's worth pointing out that for as long as We've been Buddies, Mister Jesus has pretty much always been able to handle His own fights. I mean, no offense to Anglican Church media officer Lloyd Ashton or anything (if that's even his real name), but The Dude can walk on water and turn three fishes into enough food for like six hundred frillion peeple. Plus, He literally IS the only way to get into heaven! 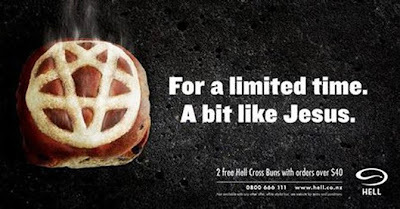 I think if Jesus's Feelings are hurt, He's probably capable of letting Hell Pizza know where they can stick their buns. In fact, I have so much faith* in Him that I'm not even going to mention the Hell Pizza thing in this letter I'm about to write to Him. Hey, how about those Cincinnati Reds? 5-0 to start the season, huh? I know that was totally You, and not just because Joey Votto and Drew Stubbs keep looking up at you every time they cross home plate, either. Hope You're having an awesome Thursday! What you CAN'T see are the unicorns lurking in the shadows, fostering and nurturing this unholy alliance via their Chinese minions. It's the unicorns who are pulling the strings here, peeple. Don't be fool'd. This isn't about cute, cuddly baby aminals, this is about the beasts of the field reasserting their dominance over the human race. It's gonna be just like Middle Earth up in here, back when Sauron and Voldemort and the dinosaurs were the Head Lizards in Charge. And mankind will once again have to look to Jesus to take up the One Ring and defeat Voldemort and Sauron and the rampaging hordes once more, just like He defeated them in the popular young adult book series, The Bible. We need Jesus now more than ever. Which of course means that old Smokey is gonna have to get involved. Long time no talk. Sorry, (Son of) Man. Totes my bad. Let's keep the unicorns where they belong: in cans. Thanks in advance, Dude. You totally rule. There. YOU'RE WELCOME AGAIN, HUMANITY. 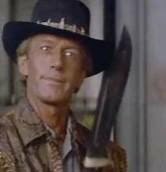 Remember the other good ol' daze before the movie Crocodile Dundee came out, when no one had ever heard of Australia before and we didn't know what a knife was? Those were the other best times. It's just a shame that the namby-pambies over at Gerber Legendary Blades are totally overreacting to the reports of injuries caused by the knife falling out of the handle of the axe. Any axe-knife worth having is also worth a few stitches and/or missing digits. What's happening to this country? It's like everyone's balls got cut off by knives falling out of the handles of their axe-knives or something. Ugh.